Our investigation was conducted during a period of ecological crisis in the coastal zone of Lake Baikal. Mass disease and mortality of the endemic sponges inhabiting the nearshore zone of the lake is one of the characteristics of this crisis. 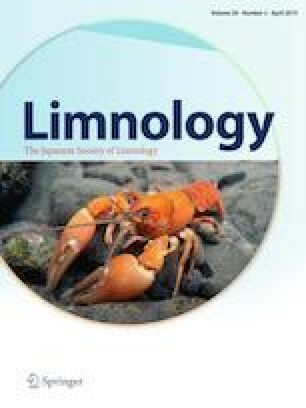 We identified and quantified infaunal organisms associated with Lubomirskia baikalensis (Pallas, 1776), which is experiencing mass morbidity and mortality. L. baikalensis specimens were subdivided into three groups depending on the degree of body damage they presented: “healthy”, diseased, or dead. We found that infauna was almost absent from “healthy” sponges. Infaunal abundance in diseased sponges was 1820 times greater than that in “healthy” sponges, and varied in relation to the type of damage suffered by the sponges. Unaffected fragments of diseased sponges were inhabited by communities that exhibited an average abundance of 13 ind/dm2, with Oligochaeta, Nematoda, Harpacticoida, and Chironomidae predominating. In the bleached fragments of morbid sponges, the average abundance of infauna was 1303 ind/dm2, with Harpacticoida, Tardigrada, Cyclopoida, and Oligochaeta dominating. The highest concentration of infaunal animals (18,293 ind/dm2) was observed in spots that were covered by filamentous cyanobacteria. Diverse and densely populated infaunal communities (4767 ind/dm2) occurred in the dead sponges, with Nematoda, Tardigrada, Turbellaria, and Oligochaeta particularly abundant. We gratefully thank the researchers of the Laboratory of Aquatic Invertebrate Biology, LIN SB RAS: Dr. N. Bukshuk (for consultation on Lubomirskiidae and reviewing the paper), Dr. E. Zaytseva (for identifying the planarian species), and Dr. A. Poberezhnaya and M. Gula (fieldwork assistance). Special thanks to the following SCUBA divers for underwater sampling: Dr. A. Kupchinsky, V. Chernykh, and Dr. I. Nebesnykh. We thank the editors and anonymous reviewers for their suggestions, which greatly improved the manuscript. The authors are very grateful to Prof. M. V. Moore (Dept. of Biological Sciences, Wellesley College, USA) for the English language editing. Financial support was provided by the following projects: sampling expeditions by the State Project of SB RAS no. 0345-2019-0009; determination of the species composition of foulings by the State Project of SB RAS no. 0345-2019-0003.